6sqft’s series The Urban Lens invites photographers to share work exploring a theme or a place within New York City. In this installment, photographer Zach Gross presents his series “Penn Station.” Are you a photographer who’d like to see your work featured on The Urban Lens? Get in touch with us at tip[email protected]. The original Penn Station, a Beaux-Arts masterpiece completed by McKim, Mead & White in 1910, evoked the kind of grandeur one would expect upon arriving in one of the greatest cities in the world, complete with a grand facade made of massive Corinthian columns and a 15-story waiting room with a steel and glass roof. This structure was demolished in 1964 and replaced with our present version, lacking any of the architectural merit or civic design of its predecessor. But recent years have sparked a renewed interest in transforming the station into an updated and better functional transit hub, falling under a $1.6 billion plan from Governor Cuomo. 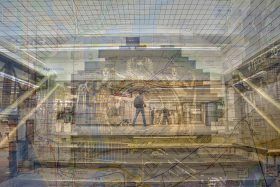 Well aware of both the history and future of Penn Station, photographer Zach Gross recently completed a unique series that layers historic imagery of the site with contemporary photos. He feels that, though the station is currently dysfunctional, “there’s still hope for a grand, more unified and uplifting structure,” and it’s this hopeful sentiment that shines through in his work.